You hear it from time to time: I-70 is shut down due to an overturned tractor-trailer and chemical spill. Most of us pay little attention to the incident unless it affects our commute. For first responders and Meritus Medical Center, a hazmat spill that involves contaminated victims triggers text messages and voicemails to members of its Hospital Emergency Response Team (HERT). The U.S. Environmental Protection Agency defines hazardous waste as liquids, solids, gases or sludges that are potentially harmful to our health or the environment. According to Joe, some of the most common spill scenarios include gasoline, diesel fuel, propane, sulfuric acid and fertilizer. Joe, a paramedic and firefighter, leads the hospital’s HERT. The HERT includes hospital volunteers from the emergency department (ED), facilities engineering, environmental services, nutrition, information technology and corporate communications to name a few. As soon as the ED receives notification from Emergency Medical Services (EMS) of a hazmat incident, 30 members of the HERT assemble in the hospital’s ED. While patients are in transit, HERT creates a controlled environment by sealing off an ambulance bay and hanging tarps. Safety supplies like masks, Dawn dishwater detergent, baby shampoo and space suits known as Powered Air Purifying Respirators fly out of storage and into action. Because EMS identifies the type of hazardous material involved in the accident before coming to the ED, the HERT knows in advance of how to care for the incoming patients. 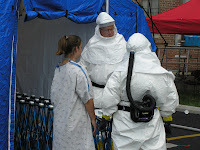 Once at Meritus Medical Center, contaminated patients are moved to a 10x10 shower room where clothing is removed and patients undergo a five to ten minute rapid shower using decontamination solution. The shower room is equipped with suction airway and oxygen ports for patients who are seriously injured. A final step involves a second shower in a separate area and a dressing room where patients are gowned. For mass casualties, like an overturned bus involving hazardous waste, the HERT sets up tents and trailers in the hospital’s parking lot equipped with electric generators, water and oxygen. This hazmat village is capable of handling 50 patients in one hour. Joe notes that the HERT runs “patient surge” drills two times a year to prepare for such an event.